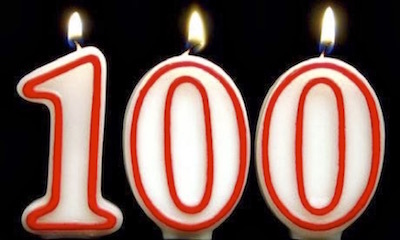 Can You Afford to Reach 100? Welcome to the new, improved, faster-to-read, better yet still-free Thoughts from the Frontline. My team and I have been doing a lot of research on what my readers want. The reality is that my newsletter writing has experienced a sort of “mission creep” over the years. Bluntly, the letter is just a lot longer today than it was five or ten years ago. And when I’m out talking to readers and friends, especially those who give me their honest opinions, they tell me it’s just too much. There are some of you who love the length and wish it were even longer, but you are not the majority. Not even close. We all have time constraints, and I wish to honor those. So I am going to cut my letter back to its former size, which was about 50% of the length of more recent letters. This week I have good news and bad news for you. The good news is that you and your children will probably have much longer lives than you currently imagine. The bad news is that you’ll have to pay the bill for them. I’ll explain what that means in a minute. First, let me thank everyone who helped produce this year’s Strategic Investment Conference, as well as all who attended. I know it sounds trite to say that this one was the best ever, but it really was. Every speaker brought a unique and valuable perspective, which the panels then mixed into new and even more interesting blends. Attendees asked probing and sometimes uncomfortable questions. I think everyone left Orlando bearing loads of new ideas. If you missed SIC, you can still get our Virtual Pass. It gives you audio recordings of all sessions, all the slides that accompanied them, and written transcripts. It’s the next best thing to being there. Click here for more information and to place your order. We will close this offer in early June, so don’t wait too long. I’m also pleased to announce that next year we’re taking SIC back to our old home at San Diego’s Manchester Hyatt. The dates are March 6–9, 2018. That’s just a little more than nine months away, so now is the time to start planning your trip. We’ll let you know when early bird registration opens in the fall. Now, on to this week’s main course. One of my team members pointed me to a World Economic Forum white paper called “We’ll Live to 100 – How Can We Afford It?” Regular readers know I’ve been saying we’ll live that long – and asking how we’ll pay for it – for several years now. It is good to see Davos Man finally catching up with me. The WEF paper has some interesting data that I haven’t seen elsewhere. To begin, it breaks down life expectancy by birth year, showing a different picture than we see from simple averages. Here are the global numbers. As far as I can tell, these estimates don’t consider the kind of major life-extending breakthroughs that Patrick Cox writes about for us and that he and I both expect to be realized in the next few years. Rather, the methodology of the WEF paper seems to depend on extending current trends. So I believe the numbers above are conservative. Note also, these are median life expectancies, not simple averages. Half the people in each group will live longer than the median. Most of today’s young children will live to see the 2100s. Some (many?) of the younger Millennials will see their lives span three different centuries. That’s astonishing. Here’s another table showing the differences among major countries for those born in the year 2007. Again, this is astounding if correct. 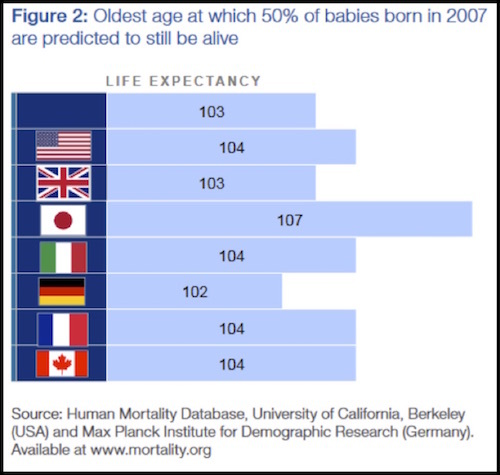 A Japanese child born in 2007, who is 10 years old today, has a 50% chance of living to 107. That will be the year 2114. Those in other developed countries are not far behind. Better yet, the coming medical technologies will let us live to those ages or more without the decades of physical and mental decline that are now common. 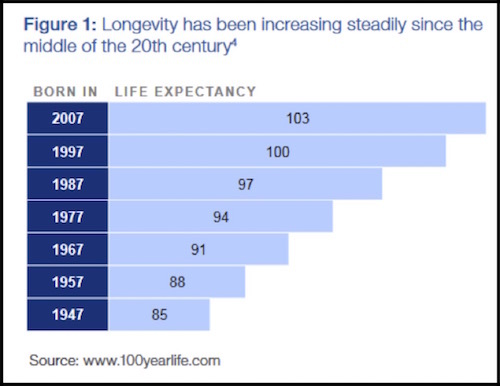 We’re not just increasing lifespans; we’re increasing “health spans,” too. The good news is that many of those antiaging breakthroughs are going to be coming to a pharmacy near you in the near future – as in five to ten years. It is likely that you will live much longer and healthier than you are currently planning to. Most of us will be happy with that outcome. The bad news is that you will have to make your money last those extra years. We had a panel at SIC with Patrick Cox and leaders of three of the biotechnology companies he follows. What they’re working on, from different angles, is almost unbelievable. It is entirely possible that we will see cancer wiped out in the next five years. Scientists are making huge strides with heart disease, dementia, spinal cord injuries, and the other great enemies of life and health. One by one, the dominoes are falling. Other companies we know about are working on the “Fountain of Middle Age,” whereby they intend to either delay or semi-reverse the aging process. It won’t take you back to your youth, but for many of us 50 years old sounds pretty good. And there are groups like Mike West’s at BioTime, Inc., that are working on technologies like induced tissue regeneration (ITR), which will literally turn back your cellular clock. This was science fiction and a pipette dream 10 years ago. Today it is simply science, and it’s coming out of the theoretical stage and the petri dish and moving further up the experimental lab chain. Some of you will object, “What will we do if everybody lives so long? Frankly, that’s a first-world problem. I see very few people who ask that question offering to die. If we live in a world that can figure out how to turn us young again, give us automated cars, and all sorts of abundant resources, you think we’ll have trouble figuring out how to feed everyone and keep them occupied? Malthus was so wrong in so many ways. While this is wonderful news for humanity, it will bring some challenges, too. 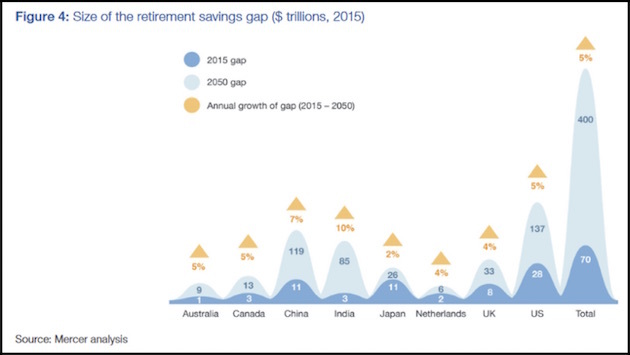 The world is not financially prepared to support as many retirement-age people as it will have to sustain in coming decades. We have some huge adjustments in store. Specifically, we already have a huge retirement savings shortfall, both public and private. I discussed that problem at length recently in Part 4 and Part 5 of my “Angst in America” series. Adding millions more person-years to the equation will make the problem much worse. The World Economic Forum’s white paper tries to quantify how much worse the personal retirement shortfall will be if current practices continue. The amounts presently earmarked for retirement income via government-provided pension systems (i.e., Social Security), employer plans, and individual savings fall far short of the mark. Here is the bad news in graphic form. The bumps you see there are the difference between what is necessary to fulfill obligations (defined as 70% of pre-retirement income) and what has actually been saved or set aside to do so. The darker blue is the 2015 gap, and light blue is a 2050 estimate. By 2050, the total shortfall in these eight countries alone will be $400 trillion. That number is so absurd that I feel very confident we will never have to face it. One way and another, some promises will be broken. The only questions are, whose and to what degree. Remember, this is just the personal savings shortfall. This is not the government and unfunded liability shortfall. Globally, that runs into the multiple hundreds of trillions on top of the $400 trillion savings shortfall. The present standard of retiring somewhere between ages 60 and 70 is not going to be sustainable when half the population lives to 80 or 90 – which is already realistic today – let alone 100 or more. It’s just not possible. If you’re like me, you don’t intend to retire at 70 or maybe not at all, but it’s nice to know we have the option. Future generations won’t. According to WEF, the global dependency ratio under current policies will plummet from 8:1 today to 4:1 by 2050. That means just four active workers for each retiree. And that’s including developing and frontier markets. Developed markets will see a global dependency ratio of about 2:1. I see no way that can work. WEF doesn’t either. Here is their advice to political leaders. Given the rise in longevity and the declining dependency ratio, policy-makers must immediately consider how to foster a functioning labour market for older workers to extend working careers as much as possible. There you have it, straight from Davos. We must “extend working careers as much as possible.” Your dream of hanging up the work clothes at 65 and going on extended vacation will remain a dream until some later date. Early retirement will survive only for the kind of people who go to Davos. Again, for me this is fine. I’m 67 and I love my work. I plan to keep at it for many years to come. But I understand many people don’t have that option. They have health problems, or their professions are being automated, or they spent their career doing physical work that is no longer possible. The medical advances I foresee will help, but they’ll take time to become affordable to everyone. Some people are going to fall through the cracks. Moreover, simply saving more money probably isn’t an answer, either. Interest rates are a function of supply and demand. You can’t invest your savings in a high-yield bond unless someone out there can borrow at that same yield. When so many of us want to lend and no new borrowers appear, supply and demand will keep yields low. We already see this in today’s near-ZIRP conditions, and they may not improve much. Part of the justification for ZIRP was that it would force capital into risk assets, thereby stimulating the economy. It now appears that the only thing stimulated was asset prices, and by and by the risk is going to catch up with those taking unwise amounts of it. That unhappy outcome will likely widen the retirement shortfall even further. Oops. The Council of Economic Advisers now estimates that artificial intelligence will replace 83% of low-wage jobs. I’m not certain how they came up with that number – it seems high – but whatever is the figure turns out to be, it’s alarming. And the jobs we are creating today are not the high-paying manufacturing jobs that everybody wants to “bring back.” They’re not there to be brought back. There is actually a quite large “re-shoring” movement going on, but the companies that are coming back are doing so with automated technology and far fewer workers than before. The advantage of using inexpensive offshore labor has fallen before the advantage of being close to your markets and “employing” robots and artificial intelligence. 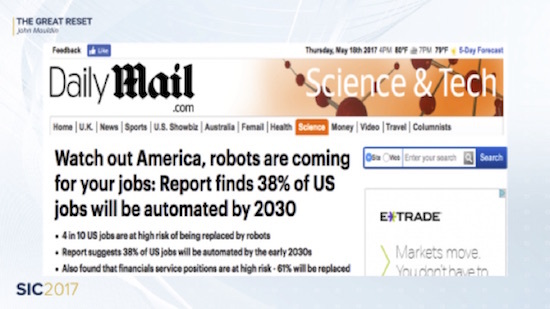 The McKinsey Global Institute published a report last December that said: “On a global scale, we calculated the adoption of currently demonstrated automation technologies could affect 50% of the world economy’s 1.2 billion employees and $14.6 trillion in wages.” That is an astonishing statistic. By the way, one of the subheads in that screenshot above points out that 61% of financial services positions are at high risk of being replaced. If you are in the financial services industry, maybe you should be thinking about how you can keep from being automated out of a job. The jobs we are creating? 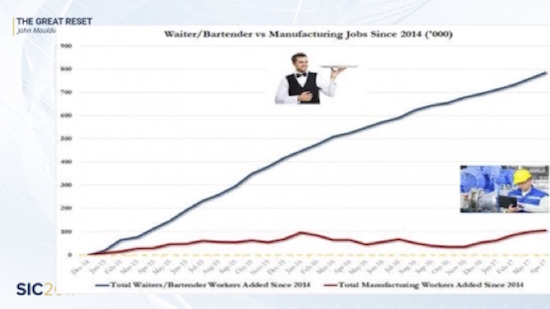 Think 800,000 waiters and bartenders versus 100,000 manufacturing jobs. I have children who work in the food service industry, and I can tell you they are making barely enough to provide for themselves, let alone raise a family or save for retirement. Officially, the US unemployment rate is 4.3%. There are 200,000+ manufacturing jobs that employers can’t find suitable, highly skilled candidates to fill. Last year, the labor force participation rate declined by another 0.2% to 62.7%. The employment-to-population ratio fell to 60%. Fewer of us are working and making enough to actually be able to save for retirement. In other words, I don’t think we can invest our way out of this. The obvious answer – extend the retirement age – has the unwelcome side effect of reducing job opportunities for younger workers. At some point that might be okay if low birth rates create widespread worker shortages, but the adjustment will take time. The solution may turn out to be something presently unimaginable. We don’t know where technology will take us and what opportunities it will create. We also don’t know what political alliances can create. What if the next time around we got not just President Bernie Sanders but a Bernie Sanders-compatible House and Senate? Could we see a wealth tax in addition to a whole slew of other taxes? Would our dear leaders be willing to tax your retirement plan so that people without adequate savings could enjoy a more pleasant retirement? Forget fairness to you as an individual, because they will be arguing about fairness to everyone in the country. Yet today the Republican majority refuses to consider instituting a value-added tax and lowering income taxes and corporate taxes to very low levels. They could do this, because they now have a majority. They are simply afraid of a VAT and are going to find themselves in far less sympathetic hands in a future crisis. What we do know is this: An unsustainable situation will not be sustained. Retirement as we know it is unsustainable. It will give way to something else, and maybe soon. Frustration is building in America because of the problems I highlighted above, and we could well see an administration and Congress that will push through a much less friendly VAT plus income tax increases, not cuts. Think it can’t happen? When your back is against the wall and you’re down to your last few bullets and the enemy just keeps coming, you start to very quickly consider all sorts of options. Within 10 years we are not only going to be thinking the unthinkable, we will be doing the unthinkable. And not just in the US but all over the world. The unthinkable will be coming to a country near you, along with unbelievable science-fiction-grade technology. I’m not doing much traveling this month until Shane and I go to the Virgin Islands the last week of June. On Monday, June 26, she celebrates her birthday. Since I asked her to marry me on her birthday last year, we are going to get married on her birthday this year. Just the two of us on the beach, and the rest of the week relaxing and thinking of the future together. While this approach does allow me to only have to remember one important day rather than two, I am informed by many friends that it does not relieve me of the responsibility to buy two presents. Shane and I have lived together for four years now, and she has pretty much figured out how I operate. She has amazing forbearance and patience – she not only puts up with my peripatetic lifestyle; she even allows me to withdraw into my chair to read or to sit in front of my computer all day writing. Not exactly the most exciting of activities. We will stay in the Virgin Islands for eight days and then come home to a full schedule. And I’m fully committed to begin to bring together the various chapters of my book, The Age of Transformation. That project will hopefully benefit from my new commitment to write fewer words per letter. Maybe I can do that for a chapter or two of the book as well. The reality is that each chapter could almost be a book of its own. I have to make sure I don’t get carried away. The book will not be a deep dive but rather a sweeping pass over the transformations that are coming to our world, not just technologically but also socially, demographically, politically, and especially geopolitically. The economic world will be turned upside down as we make decisions to do previously unthinkable things to get clear of the enormous debt burdens and bubbles we created. And with that I must hit the send button. You have a great week. Finally, The Fed Fights The Stock Market? - The Fed has been trying to get back toward a "normal" monetary policy stance for some time. - Influential and well-connected Fed head John Williams recently outlined the Fed's thinking, which is for a very large shrinkage of its balance sheet. - My view is that, if implemented, this would tend to have significant effects on reversing P/E expansion seen recently, or at least in inhibiting further P/E expansion going forward. - In addition, recent real GDP and inflation levels are not looking "too hot," a worry expressed by Dr. Williams. - Thus, the question is raised in this article as to whether stock traders will again have an anxiety attack in the months ahead, seen so often in hurricane season. The third implication that stems from the fact that financial market conditions matter in the conduct of monetary policy pertains to the so-called "Fed put" with respect to equity prices. The notion here is that because the Federal Reserve cares about unanticipated and undesired changes in financial market conditions, the Fed will respond to weakness in equity prices by easing monetary policy - essentially providing a put to equity investors. The expectation of such a put is dangerous because if investors believe it exists they will view the equity market as less risky. This will cause investors to push equity market values higher, increasing the likelihood of an equity market bubble and, when such a bubble bursts, the potential for a sharp shock that could threaten financial stability and the economy. Let me be clear, there is no Fed equity market put. To put it another way, we do not care about the level of equity prices, or bond yields or credit spreads per se. Instead, we focus on how financial market conditions influence the transmission of monetary policy to the real economy. At times, a large decline in equity prices will not be problematic for achieving our goals. For example, economic conditions may warrant a tightening of financial market conditions. If this happens mainly via the channel of equity price weakness - that is not a problem, as it does not conflict with our objectives. This is clear and emphatic, and the Fed now feels this is the right time economically, financially, and politically to press on with normalization. The most recent FOMC minutes showed that the Fed believes that stock prices are significantly elevated, though not in a bubble, and it sees the uptrend and wants to avoid a bubble, as the closing sentence of the first paragraph makes explicit. The audited annual report of the Fed for 2007 showed that its assets were $873 B and $915 B at the end of 2006 and 2007, respectively. The growth rate in 2007 was 4.8%. Today, per the Fed's May 25 H.4.1 report, this number grew to $4.52 T. That's about an 18.5% increase. Let's say over time, this number has grown about 6%, which is the rate of nominal GDP growth since 1929. This represents massive "stimulus," also called money printing. If one subtracts the $2.22 T that are excess reserves, bringing adjusted Fed assets to $2.3 T, the CAGR of Fed assets since the end of 2007 is still a very high 10.2%. However, there's no reason to do that subtraction. Almost all the $3.6 T balance sheet expansion since 2007 entered the financial system. Per the successor to Fed Chair Janet Yellen as president of the San Francisco Fed, John Williams, in a recent interview with Bloomberg TV, the Fed is looking to bring excess reserves down to about $300 B or by nearly $2 T. If one ignores growth of the economy, that would bring the Fed's balance sheet to $2.6 T. Counting in growth, then I'm going to use $3 T as the terminal balance sheet after a proposed five-year program. That would mean about a $300 B, or $25 B per month, "quantitative tightening" program may begin in Q4 of this year. Before discussing what this might mean for investors, let's look at the Bloomberg News article summarizing the interview with Dr. Williams. Why is the Fed planning quantitative tightening? Federal Reserve Bank of San Francisco President John Williams sees a "much smaller" Fed balance sheet in about five years, at the end of an unwinding process that could start with a "baby step" later this year. "How big will the balance sheet be five years from now, when this has all happened?" Williams said in a Bloomberg TV interview with Haslinda Amin in Singapore on Monday. "That is something we haven't decided on. It will be much smaller than today." The politics of this are interesting. Just as Ben Bernanke committed his successor, Janet Yellen, to a taper of QE 3 in 2014, beginning quantitative tightening (my term, to be sure) this year sets a precedent that may require a hurdle or two such as recession to be reached before discontinuing that policy. The interview spent most of its time on other matters. Dr. Williams supported the idea that the Fed will raise rates two more times this year, presumably at the next June meeting and then in September. "The economy is doing well, with good momentum," he said... "We have a way to go on inflation goals but I am optimistic about the economy." The policy tightening aims to avoid letting the economy run "too hot for too long," Williams added. Are we really at risk of an overheating economy? This is discussed in the next two sections. Ending this policy will help reverse accommodative financial conditions. Meaning tighter money. Meaning the mortgage and Federal debt issuance that the Fed has indirectly been monetizing to the tune of hundreds of billions of dollars a year (my estimate) via QE 1.5 is going to end of shrink. So, that's one headwind to asset price valuations. The other is the micro, namely - dude, where's my overheating? The inflation rate was increased by the yoy changes in crude oil prices, of which a reversal in trend is almost fully baked in the cake. Over the past year, reported GDP rose from $18.04 T to $18.57 T, a 2.94% rate. Remember, these are nominal GDP growth numbers. They look like the real GDP growth numbers from the 1950s and 1960s, and again the good years in the 1980s and 1990s, but no such luck. That's what slow population growth and modest productivity growth rates will do. Concluding remarks - how much of a threat to stock prices (and bonds) is the Fed? Shrinking the money supply affects real economic performance. It also reduces the fuel that powers stock prices. It is designed to make money scarcer, or in the Fed's view, to put the financial system on a diet after years of being force-fed by QE. The ongoing QE process, including both QE 1.5 and the lingering effects of all the money created by the Fed since 2009, has pushed the S&P 500 (NYSEARCA:SPY) to much higher levels than where it was when the profits of the companies in the index first reached current levels (mid-2014), or when national profits as measured by the BEA in its NIPA accounts first reached current levels (2011). Thus, there's a lot of P/E (and other valuation) reduction that could occur if excess reserves were brought down by almost $2 T. In addition, just think of how much of the Fed's trillions of dollars of Treasury and mortgage bond securities owned mature each year, and then think of $300-400 B of that new money no longer entering the bond market to purchase new mortgage and Federal debt. Something's going to give, and it's going to be economic performance, in my view. Banks are lending again. Earnings estimates for such core parts of the economy as Union Pacific (NYSE:UNP), United Technologies (NYSE:UTX), Deere (NYSE:DE), and Caterpillar (NYSE:CAT) are rising. Q1 was the first in some time in which earnings did not disappoint as reporting season began and progressed - a good sign. So, it's a "what's not to like" situation for equities. But the business upturn after the 2015-6 slowdown is young. The Fed, understandably, fears stagflation, and it fears yet another 1999-type stock market bubble. Over the long run, this may be just the right thing to do. In the shorter run, meaning this year, this is just what speculators hate. Some readers may remember that I turned bearish on the SPY in a mid-December 2015 article, and that bearishness was based on a combination of a sluggish economy and a Fed that was determined to raise rates. I would look at the possibility of a Fed error again in thinking of stock prices and the Fed's preferred plans as laid out methodically and in a matter-of-fact manner by Dr. Williams. When the Fed is hawkish, fighting that 2.5% or so inflation rate and talking about overheating, focused on a 4.5% of so unemployment rate rather than looking at the depressed employment:population ratio, history suggests over and over that margin traders will reduce their leverage. There are lots of traders who own long bonds with leverage, as well. As the Fed continues to push short rates up, seeing a good economy and motivated by the goal to normalize policy sooner rather than later, more car buyers get priced out of the market. The same holds true for home buyers. So, to be a little sarcastic, does the growth come from the app economy? No, not really, because Facebook (NASDAQ:FB) and the Google subsidiary of Alphabet (NASDAQ:GOOGL) (NASDAQ:GOOG) make their money from advertising real goods and services. The free stuff is like old-fashioned "free" TV, paid for by producers of stuff that costs money to buy. Investors the past eight years have largely benefited from a one-way trade. If the economic news was disappointing, the "Fed put" was in play. If the economic news was good, then good news was indeed good for share prices. Now that dynamic is - palpably - in danger of being turned around 180 degrees. If Janet Yellen's successor at the S.F. Fed can worry in public that 3 1/2% nominal GDP growth and a low rate of employment of working age people mean that the Fed should focus on the economy running "too hot," then good news for the economy may well be bad news for stock prices. What would deter the Fed from shrinking the money supply big time as Dr. Williams predicts will occur? Bad news on the economy would do it, which would be better for bonds and bond funds such as the popular unleveraged iShares long T-bond fund or (NYSEARCA:TLT) or the more volatile and less well-known PIMCO zero coupon long T-bond fund (NYSEARCA:ZROZ); and worse for stocks. Thus, I think the Fed poses headwinds for stock valuations. Taken in conjunction with typical summer seasonal patterns, a sinking spell for stock prices would be a reasonable occurrence. After all, we saw such an event almost every summer from 1995 to 2000, when the markets were soaring. Saying all that, of course, there are other factors influencing stocks. The economy could, in fact, accelerate and overcome monetary counter-cyclical factors. The Fed could threaten all it wants, but the President gets to nominate a new Fed chair early next year, and that person could take an alternative point of view that would be more friendly to the markets: standing pat. After all, growth is moderate; inflation is moderate. Why not just let growth plus inflation gradually diminish excess reserves at their own pace? That would be much friendlier to investors and their (our) long positions, I would think. Looked at very broadly, the Fed has been "easy" from late 2008 to late 2014, when QE 3 ended. That "ease" expanded its balance sheet, roughly equal to the base money supply, by about a 25% CAGR by the time QE 3 ended in Q4 2014. Since monetary policy acts with a lag of approximately one year, in a sense, it's been easy until it raised rates at the end of 2015. It is more hawkish now that it has been in quite some time, possibly more hawkish in relation to actual economic fundamentals since its tightening in Y2K, 17 years ago. It took several interest rate hikes in 1999 and 2000 for investors to give up on Internet stocks. It took 17 rate hikes from 2004 to 2006 for the housing bubble to pop. So, we shall just have to see what the Fed does and how traders react month to month this year and next. Over the very long term, the Fed is a creature of government, and the US government loves to point to high stock prices as a sign of its brilliance and/or beneficence, or at least basic competence. So, a very big picture view of things involves looking for ways to participate in that government-approved goal of a "strong" stock market. It's going to be interesting to see how this "take away the punch bowl" mindset of the Fed and resultant psychology of traders fit in with the current bull market view that stock prices are still too low in relation to today's interest rates. Given the fact that stock and long T-bond total returns have jointly advanced by about 12% per year over the past six years, I cannot view the secular bond bull market as unthreatened by the Fed. What the Fed has created, it may wish to uncreate, or "normalize." And, this could occur to stocks and bonds. Virtually every class of US debt — sovereign, corporate, unsecured household/personal, auto loans and student debt — is at record highs. Americans now owe $1tn in credit card debt, and a roughly equivalent amount of student loans and auto-loans which, like the subprime mortgage quality that set off the 2008 financial crisis, are of largely low credit quality (and therefore high risk). US companies have added $7.8tn of debt since 2010 and their ability to cover interest payments is at its weakest since 2008, according to an April International Monetary Fund report. With total public and private debt obligations estimated at 350 per cent of gross domestic product, the US Congressional Budget Office has recently described the path of US debt (and deficits) as almost doubling over the next 30 years. But this is not just a US phenomenon. Globally, the picture is similarly precarious, with debt stubbornly high in Europe, rising in Asia and surging across broader emerging markets. A decade on from the beginning of the financial crisis, the world has the makings of a fresh debt crisis. In November last year, unsecured household debt in the UK passed pre-financial crisis highs in 2008. In the UK, debt excluding student loans crept up to £192bn, the highest figure since December 2008, and it continues to rise this year. Meanwhile, in the eurozone, debt-to-GDP ratios in Greece, Italy, Portugal and Belgium remain over 100 per cent. As of March there were more than $10tn negative yielding bonds in Europe and Japan. There is also the perennial risk and market concern that debt levels in China will at some point bubble to the top of the country’s economic woes in a very damaging way. Among the most risky are non-performing loans of state-owned enterprises, and mismarked and therefore not properly accounted for debt obligations in the over-heated real estate market. Agenda-setting commentary from leading policymakers, academics and writers around the world. Our contributors share their ideas and opinions on the pressing global issues of our time, in finance, politics, economics and foreign policy. More broadly, emerging market borrowing is surging. Sales of EM corporate dollar-denominated notes have climbed to about $160bn this year, more than double offerings at this point in 2016 and the fastest annual start on record, according to data compiled by Bloomberg going back to 1999. The total stock of foreign currency EM debt stands at more than $15tn. The threat of a looming crisis is not solely down to the absolute volume of debts. At least three things make the situation especially precarious. First, debt — particularly dollar denominated — is becoming more expensive as market expectations are pricing at least three rate hikes by the US Fed this year, and a relatively strong dollar is putting pressure on borrowers to service foreign currency obligations. The recent downgrades of South Africa to junk status follow a year in which credit rating agencies cut EM borrowers’ grades in record numbers. Moody’s downgraded 24 sovereigns (including Brazil, Nigeria and Saudi Arabia) in the first half of 2016, adding to concerns as to whether borrowers will be able to service their obligations. Second, the ability to repay debt is under strain in countries whose revenues stem disproportionately from commodities, whose prices have suffered. Furthermore, nations exposed to significant Chinese trade and investment face fiscal stress as China itself has a relatively soft economic outlook. Finally, the prevailing mixed global economic growth picture — underscored by the forecasts in the recent IMF World Economic Outlook — prompts questions as to how (and indeed whether) outstanding debts will be paid or brought under control. It is possible that US corporate debt repayment could be boosted by president Donald Trump’s plans attract $2.6tn in corporate cash residing offshore back into the US. Barring any stipulations on its use, the prospect of a significantly low repatriation tax of just 10 per cent (compared with the 35 per cent current corporate tax rate) could help put a meaningful dent in outstanding corporate debt obligations. Meanwhile, with crippling student debt now a political issue, there is scope for a resolution that could see significant writedowns and debt forgiveness with vast amounts potentially subsumed on to the government balance sheet. But neither of these would help debt repayment outside the US. Of a shortlist of prescriptions to escape unsustainable debt — from outright default and austere fiscal policy to bailouts — only growth itself can lift countries out of high indebtedness in a non-disruptive way. Without it, we have the makings of a debt crisis that would reverberate around the world. 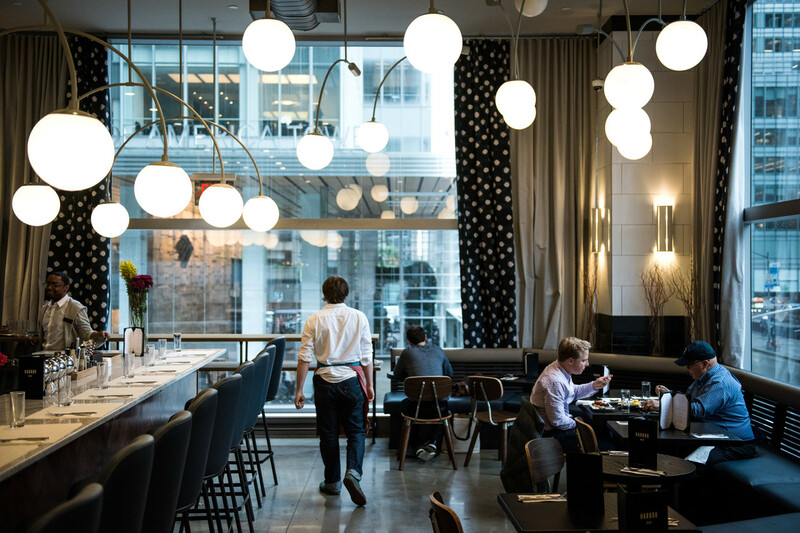 The U.S. restaurant industry is in a funk. Blame it on lunch. Americans made 433 million fewer trips to restaurants at lunchtime last year, resulting in roughly $3.2 billion in lost business for restaurants, according to market-research firm NPD Group Inc. It was the lowest level of lunch traffic in at least four decades. While that loss in traffic is a 2% decline from 2015, it is a significant one-year drop for an industry that has traditionally relied on lunch and has had little or no growth for a decade. “I put [restaurant] lunch right up there with fax machines and pay phones,” said Jim Parks, a 55-year-old sales director who used to dine out for lunch nearly every day but found in recent years that he no longer had room for it in his Schedule. Like Mr. Parks, many U.S. workers now see stealing away for an hour at the neighborhood diner in the middle of the day as a luxury. Even the classic “power lunch” is falling out of favor among power brokers. Even some restaurant-company executives don’t go out for lunch. Employees at Texas Roadhouse Inc.’s Louisville, Ky., headquarters order in so often that they know the delivery drivers by name. “A lot of our folks are trying to be more efficient,” company President Scott Colosi said. Cost is another factor working against eating out for lunch. While restaurants have raised their tabs over the past few years to cope with rising labor costs, the price of food at supermarkets has continued to drop, widening the cost gap between bringing in lunch and eating out. Restaurants are adapting by offering delivery, faster service and smaller portions. But the shift signals trouble for the industry, which makes more money serving meals inside restaurants, where soft drinks, alcoholic beverages, appetizers and desserts boost margins. Maintaining nearly empty dining rooms is costly. Among the hardest hit are casual sit-down restaurants—such as Dine Equity Inc.’s Applebee’s and Ruby Tuesday Inc. —because of the time it takes to order, get served and pay. Such establishments last year saw their steepest ever decline in lunch traffic, according to NPD. Even fast-casual chains that cater more to harried customers with counter service instead of wait staff are experiencing slower growth. Lunchtime traffic at those restaurants—excluding Chipotle Mexican Grill Inc., which has suffered steep declines in the wake of disease outbreaks—grew 2% last year after posting growth of 5% or higher in each of the prior four years. The pain is spreading to suppliers. Meat giant Tyson Foods Inc. recently said a 29% drop in quarterly earnings was due partly to the decline in restaurant traffic. “Consumers are buying fresh foods, from supermarkets, and eating them at home as a replacement for eating out,” Tyson Chief Executive Tom Hayes said. 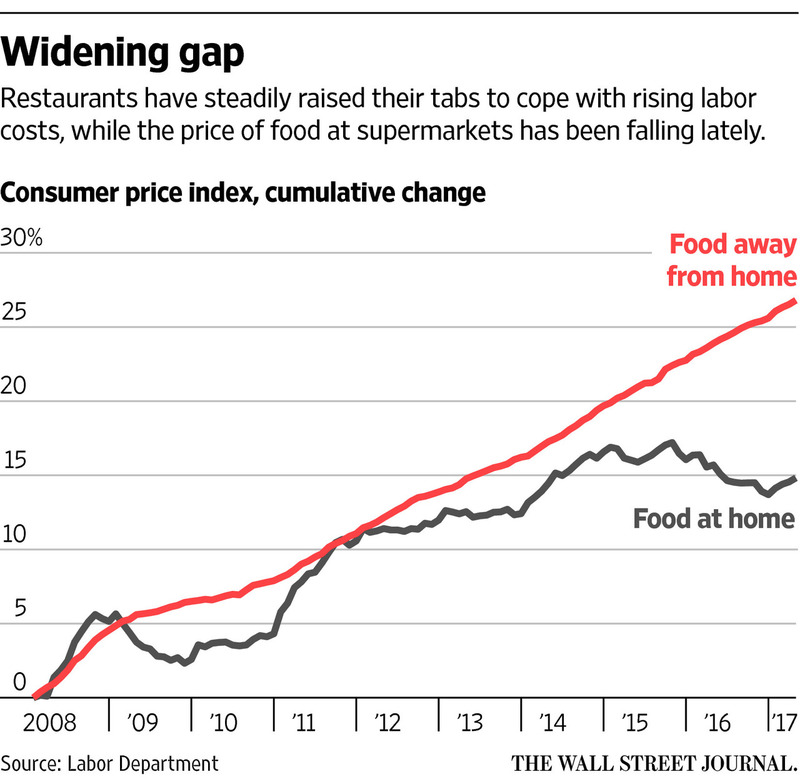 The average price of a restaurant lunch has risen 19.5% to $7.59 since the recession, as rising labor costs pushed owners to raise menu prices—even as the cost of raw ingredients has fallen. According to the Bureau of Labor Statistics, the U.S. last year posted the longest stretch of falling grocery prices in more than 50 years. “We believe significant food deflation was the primary culprit behind last year’s weakness, favoring food at home pricing over food away from home pricing to a degree not seen outside of the global financial crisis,” Sanford Bernstein analyst Sara Senatore said in a recent report on the restaurant industry. Despite the traffic decline, dollar sales at lunch were flat last year because of the menu price increases. But restaurants can’t raise prices indefinitely. In fact, many now are offering lunch discounts to bring people out to eat. 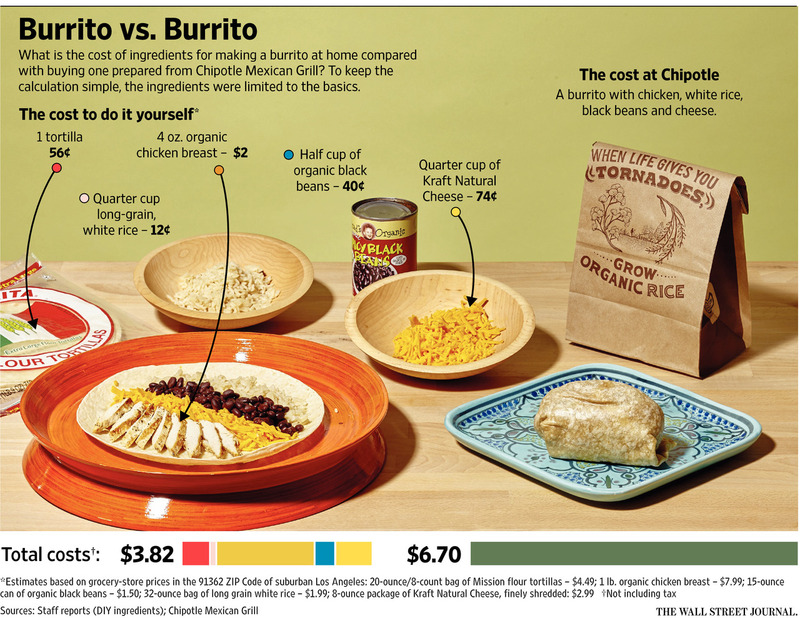 Some lunch specials at casual-dining restaurants cost less than a fast-food meal. Lunch can be had for $6 at Brinker International Inc.’s Chili’s Grill & Bar, and for as low as $6.99 at Darden Restaurants Inc.’s Olive Garden. Brazilian steakhouse Fogo de Chão Inc. —where lunch can take two hours and cost up to $34—last year introduced a $15 lunch special of salads, soups, cured meats and stews that can be completed in under an hour. After it saw lunch traffic “fall off” in late 2015, sports-bar chain Buffalo Wild Wings Inc. introduced a cheaper “fast break lunch” menu with smaller portions. Chief Executive Sally Smith said the new menu—and a 15-minute service guarantee—recently helped improve traffic. Many restaurants are restructuring. Cosi Inc., Garden Fresh Corp. and Old Country Buffet owner Buffets Inc. recently have filed for chapter 11 bankruptcy protection. Others, like Ruby Tuesday and Famous Dave’s of America Inc. have been closing restaurants. Bob Evans Farms Inc. in January sold its struggling restaurant business to private-equity firm Golden Gate Capital. On the same day, Bob Evans announced that its packaged-foods arm was acquiring a potato-processing company in an effort to focus on growing demand for refrigerated side dishes. Josh Benn, managing director at corporate-finance advisory firm Duff & Phelps Corp., said new restaurant concepts, such as those that cater to consumers’ desire for faster, healthier food, are on the rise. “I think there’s a death and regeneration happening in this whole industry,” Mr. Benn said. CAMBRIDGE – US President Donald Trump’s administration has now released its budget plans for fiscal year 2018. Among the details provided in the document, entitled America First – A Budget Blueprint to Make America Great Again, are projections for the expected path of gross federal debt as a percentage of GDP, which is shown to decline from its current level of about 106% to about 80% in 2027. Debt held by the public is expected to mirror this path, shrinking from 77% to 60% over this period. Unfortunately, neither projection is credible. A sustained and marked decline in government debt (relative to GDP) would be welcome news for those of us who equate high indebtedness with the kind of fiscal fragility that reduces the government’s ability to cope with adverse shocks. But, as many critics have pointed out, the economic assumptions underlying the Trump administration’s benign scenario appear improbable. In fact, they are also internally inconsistent. The Trump budget assumes a steady spell of 3% GDP growth, which appears to be at odds with the prevailing trends of weakening productivity performance, slowing population growth, and a significantly lower level of labor force participation. These factors are all reflected in recurrent downward revisions to potential GDP growth by institutions such as the Federal Reserve and the Congressional Budget Office (CBO). A new study by the non-partisan Committee for a Responsible Budget presents a very different outlook for US deficits and debt from the one contained in Trump’s budget blueprint. It estimates that under realistic economic assumptions from the CBO, debt in Trump’s budget would remain roughly at current levels, rather than falling precipitously (as deficits would remain above 2% of GDP, rather than disappear by 2027). Furthermore, the study shows that relying on assumptions that are more in sync with the consensus economic outlook implies a deficit of 1.7-4% of GDP by 2027, with debt at 72-83% of GDP. But, even giving the administration the benefit of the doubt and accepting the possibility of sustained 3% GDP growth for the US, another set of critical assumptions drive the rosy deficit and debt projections produced by the Office of Management and Budget (OMB): the expected level and path of interest rates. To state the obvious, lower interest rates imply lower debt servicing costs, which in turn mean lower nondiscretionary outlays, smaller deficits, and lower debt. On the surface, the projections for short- and long-term (ten-year) interest rates embedded in the 2018 budget are in line with the prevailing Blue Chip forecasts. In effect, for fiscal year 2018, the budget assumes slightly higher short-term rates than the consensus. In fact, the budget assumes the best of all worlds, not the Blue Chip one in which interest rates remain low but GDP growth ambles along at around 2%. With real (inflation-adjusted) interest rates remaining near record lows, a marked increase in long-term growth, as the administration forecasts, would be historically anomalous. In the OMB document, the real interest rate on three-month Treasuries is expected to stay below 1% over the decade. Furthermore, in that projection, the term premium disappears almost entirely. At present, ten-year Treasuries offer more than three times the yield on three-month Treasuries. Over the medium term, the budget assumes that ten-year rates will be barely above their three-month counterpart. Historically, flat yield curves have been associated with tight money and high-interest-rate policies. What kind of policies and environment can deliver significantly faster growth and inflation, without any pressure on interest rates? A combination of solid growth and sustained low real interest rates was the norm in the US for much of the 1940s-1970s, when (as I have documented elsewhere) financial repression prevailed, owing to heavily regulated capital markets and an accommodative central bank. In contrast, if history is a guide, a policy mix characterized by financial de-regulation (a Trump favorite) and an independent central bank facing potential full employment and overheating would be a harbinger of higher interest rates. And with higher interest rates comes a heavier debt-service burden (substantially heavier than in the past, given current debt levels), wider deficits, and higher debt. There seems to be a serious internal inconsistency in the high-growth/low-real-interest-rate scenario presented in Trump’s 2018 budget plan. If not, contrary to the administration’s public statements, financial markets will have to live with a heavy dose of financial repression in the years ahead.